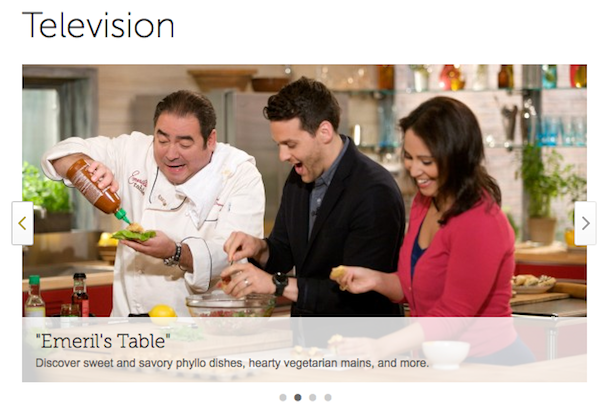 Watch Alejandra on Emeril's Table This Week! Here is a little rundown of our experience on the show! The new show (produced by Martha Stewart's company) is designed in a kind of roundtable style where a group of 4 or 5 guests join Emeril at a table and watch him prepare a meal. On each episode, the guests all have something in common; our episode featured newlyweds, while other episodes featured themes like "book club members" or "poker players," etc.. On our show, the theme didn't have anything directly to do with the food we made, but it gave us something to talk about (besides food, of course!). 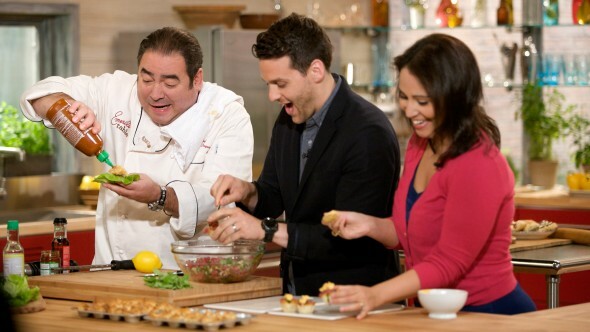 We also got to help a bit with the cooking, and were encouraged to ask Emeril questions throughout the show. Our episode is called "The Magic of Phyllo," and in it we learned to make several buttery flaky phyllo dishes included a tuna tartare, baklava, and phyllo-wrapped prawns. The taping was SUCH a blast! We got there early in the morning and started off with hair and make-up. I absolutely LOVED the make-up artist as she was really funny in this really no-nonsense sarcastic way, and did a great job with my makeup. I told her I tend towards the more theatrical with my make-up (and, let's face it, everything) so she gave me a bold pink lipstick and these incredible false lashes that I didn't want to ever take off. After make-up, the hairstylist tried unsuccessfully to tame my cowlicks (::sigh::), and then we headed to wardrobe, where a stylist picked outfits for us from clothing we brought from home (all solid, bright colors). They only shot us from the hip and up, so I was wearing comfy leopard print slipper flats on my feet the whole time (shhhhhh). Once we were all dressed, the producer came by to instruct us on a few guidelines for the show and walk us through the process. 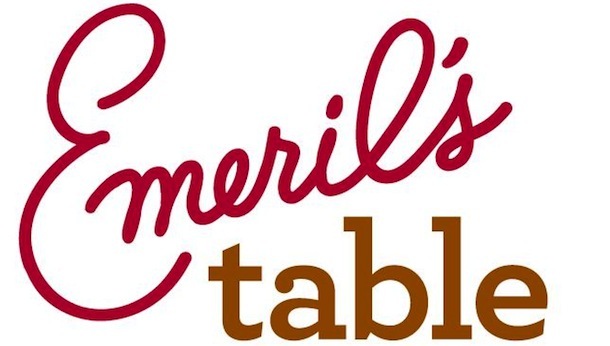 We were told to always address Emeril as "Chef" (vs "Hey, Emeril!"). And, most importantly, we were also specifically asked to NOT say the word "Bam!" at any point during the taping. We started laughing when we heard that and she explained that apparently people always just want to say "Bam!" to him, but he doesn't do that anymore. I think he is trying to evolve his brand a bit past the "Bam!" with this new program, which would explain it. 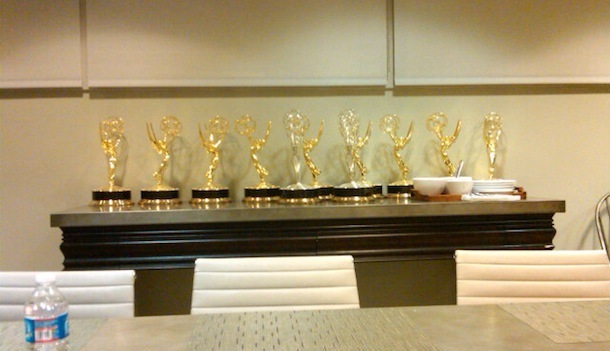 While we waited for our taping to start, we hung out in a conference room decorated with a bunch of Martha's EMMY and Golden Globe statues. They also had tasty homemade granola and yogurt there for us to snack on, which I thought was "very Martha" of them. Once the first show he was taping finished, Emeril came out to change into a fresh chef's coat (I think he wears a new one for each show) and greet us before our taping. He was super friendly and it was nice to get a chance to meet him before going on set. When it was time to tape the show, we headed to the set (which is also the set for the Martha Stewart show), and took our places at the table. We were each served a glass of prosecco, and in just a few minutes, the show began! I was totally fascinated with the way the show was produced. It was shot very quickly in real time (with breaks between segments) though all the recipes were prepared to different stages in the test kitchen by a staff of cooks and a head chef. Emeril would run through some of the steps on cameras and then they'd break for commercial and swap out what he was working on for the almost completed dish, which he would then finish on air. One thing I thought was pretty cool was they way that whenever they finished taping a dish, an assistant would come and whisk it away to a little mini photography studio set in the corner of the room where they would take beauty shots of the food. Once they finished photographing, we (and the staff) were then able to eat it. After Emeril's part of the show was done, they took some random shots of us just eating and talking to each other, during which we were encouraged to talk about the food we ate. (It was really good and we said as much.) I did my best to eat elegantly; not the easiest thing when the food in question is a giant phyllo-wrapped prawn complete with eyeballs and long tentacles! The one thing that made me laugh for days after the taping (apart from the no "Bam!" 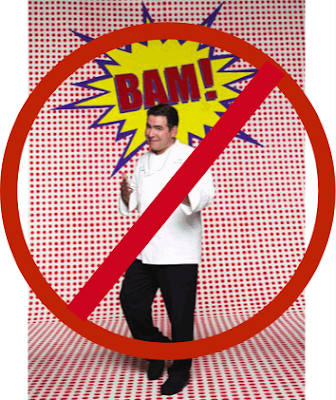 rule) was the way that Emeril just could not seem to get my name right throughout the show. I actually can't wait to see the final show to see if they edited it in any way because he literally called me by about 6 different names throughout the taping. All close variations of Alejandra (Alexandra, Alexandria, Alezandra, etc. ), but just never quite right. On one occasion, a producer pulled him over and reminded him of my name, which was funny because he then proceeded to say it out loud perfectly to me about 6 times, only to call me Alezandra again once the cameras started rolling. I wasn't alone though; he also had some trouble with equally tricky sriracha sauce and kataifi (shredded phyllo), which he kept calling "gaddafi." Yes, as in Muammar. Despite his wacky pronunciation, you can tell he really knows his stuff. In between takes, some of the producers or test kitchen staff would ask him questions about food, and he always knew the answer and would elaborate with a little story. I would have loved to have been able to hear more of those! 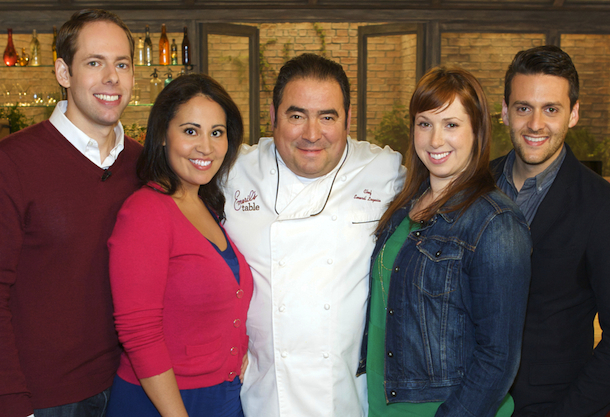 Once the taping finished, we took a group photo with Emeril in front of the set, and then we all got to take the food we made back with us to the green room where we literally finished every single bite. Of all the dishes, my favorite was definitely the prawns, followed by the tuna wraps. Once every speck of phyllo was gone, we all packed up our clothing and headed out. The staff was really relaxed and funny, and it was great to work with them throughout the entire morning. On our way out, they even gave each of us one of Emeril's cookbooks to keep! Want to check out the show? Tune in THIS Thursday, October 6th at 11AM on the Hallmark Channel. (Check your local listings for channel info.) Note that they show 2 episodes of the show back-to-back and we're on the first one (the Magic of Phyllo episode). (Unfortunately Eugene and I don't actually get the Hallmark Channel with our cable package, so we're going to have to try to finagle a way to see the show since they can't provide DVDs for us. If any of you have it and can figure out a way to record it and email it to me, please email me and let me know as that would be awesome!) UPDATE: I upgraded our cable! So we get the channel now!